I don't really think of peas as a greenhouse crop. Last year I started the peas off in guttering/eavestrough in there, but then planted them out in the garden. 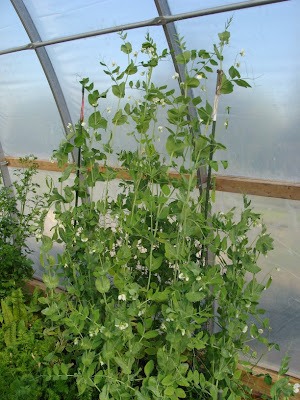 This year I've had mixed success, with most of the Lincoln peas I sowed in the greenhouse being eaten. I started a third batch of those indoors and they're now in the garden, but are only a few inches high. 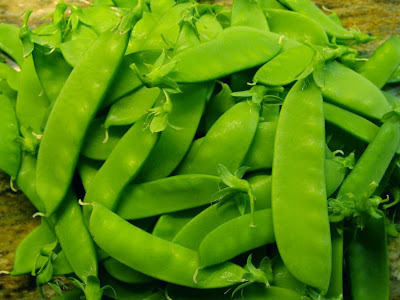 The sugar snap peas, on the other hand, were ignored by the rodents (why?) and have romped away to the point where they're now ready to pick. I've never frozen this type of pea before, but at this rate of production I think I'm going to have to!